I'm back! Yes, I fell out of the habit of blogging and I have missed it. Life got a little busy and I got a little behind on my "To Do" list. This is the last week of Sale A Bration. Stampin' Up! order shipped direct to your home. this is a SNEAK PEEK!!!! sister in law, Diane Blumenstock. in person as it's gorgeous!!! Diane gave Stampin' Up! TWO THUMBS UP! for the quality of their Fabric. Woohooo!!!!!!! Mornings seeing all the lovely things. Love Mom. 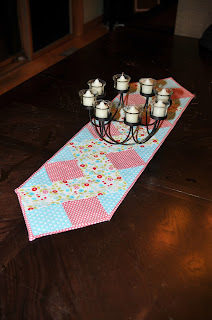 Gorgeous table runner Diane!!! Looks amazing on your table.